Only 19 kokanee salmon returned to spawn this year. A striking ebb in the number of Kokanee salmon in Lake Sammamish, just east of Seattle, has officials worried that extinction is around the corner. Five years ago, more than 18,000 of the unique freshwater species of sockeye returned to spawn in Lake Sammamish tributaries. This past year, only 19 were counted. While a number of possible factors are likely to blame for the dramatic drop in the population, King County environmental affairs officer David St. John said warm lake temperatures in the summer from 2014-16 was likely the largest driver. Lake Sammamish kokanee life cycles are measured in roughly three-year cycles. Kokanee migrate from Lake Sammamish to tributary streams where they spawn. The resulting offspring, juveniles known as fry, then move to the main lake where they remain for just under three years before returning to the streams to spawn, continuing the cycle. Unlike other species of salmon that make their way through the Ballard Locks into the Pacific Ocean, native Lake Sammamish kokanee spend their entire lives in freshwater. This makes them unique, and it also makes them particularly susceptible to changing lake conditions. Lake Sammamish is one of only four lakes in the state that has entirely freshwater kokanee. St. John said a condition known as “the squeeze” is likely the driving factor behind the severe drop in kokanee numbers. Salmon prefer cool water — if the water gets too hot, it can kill them — so when the water temperature rises to around 60 degrees, kokanee dive deeper in search of a more hospitable environment. At the bottom of the lake, plant and organic material accumulates over the summer and begins to decompose, which creates a zone where oxygen is scarce. This puts a “squeeze” on salmon, limiting their movement to a livable zone between the two where the kokanee can survive. St. John said over the course of three summers, the hot layers of water near the top may have become thicker and largely wiped out the habitable layers the fish depend on for survival. While lake conditions were good for kokanee in 2017, St. John said the “squeeze” has occurred four out of the last six years. In the preceding 19 years it only happened four times. “If it wasn’t the squeeze that got them, it was other things that were feasting on stressed-out fish,” St. John said. When fish are under stress they become more vulnerable to disease, predators and parasites — all of which continue to rack up a body count. While it can be difficult to gauge how many fish will return, St. John said they are anticipating only 100 kokanee or fewer to return this winter. If that is the case, it could for the first time push the number of salmon below the number required for a naturally self-sustaining population. To put this in perspective, King County fish biologist Jim Bower said from 2015-16, a total of roughly 260,000 kokanee fry were in the Lake Sammamish system. The typical survival rate is around 10 percent, but none of those fry returned during the latest count, Bower said. Historically, there were up to three runs of kokanee in the lake, beginning in September and stretching through December. The two early runs went extinct in the 2000s and biologists will be monitoring the remaining run this year to get an idea of how they should proceed. “We’re basically prepared for the worst and hoping for the best,” Bower said. King County has a number of strategies to help the struggling population. These include trapping fish and taking them to the Issaquah Hatchery where sperm is frozen and saved for future years. 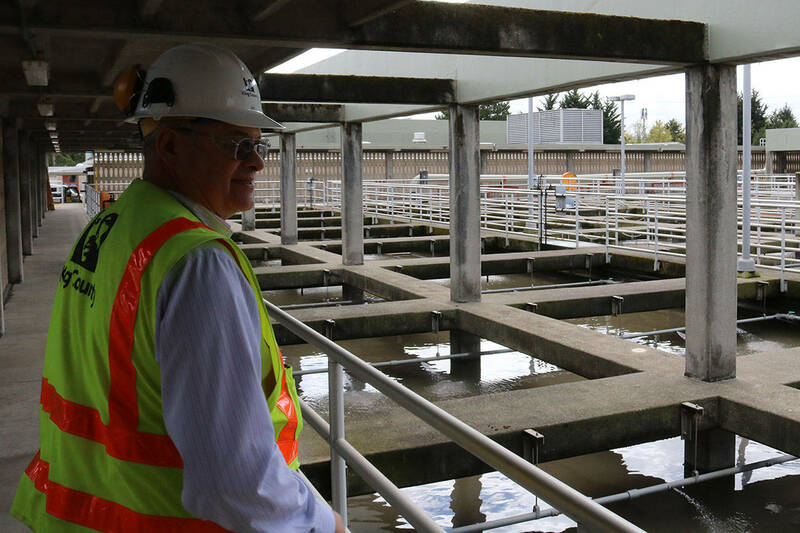 Salmon raised at the hatchery are released into Lake Sammamish tributaries to supplement the number of naturally spawning fish. Typically, these fish are released in the spring, but because the “squeeze” hits fry especially hard, they will be waiting until next fall to release them. “We think that will help improve survival,” St. John said. A final option for repopulating Lake Sammamish kokanee would be to take fry from the existing supplementation program at the hatchery and raise them entirely at the hatchery. This would preserve the unique genetic stock, which would be used to breed new generations. However, this strategy would be a last resort. The county will know if it needs to implement this following the January 2019 kokanee count. Locals can help the struggling fish too by not letting fertilizers drain into Lake Sammamish, which can boost the growth of underwater plants that later die and contribute to reduced oxygen levels near the lake bed. Additionally, keeping as much land as possible unpaved allows more water to seep into the groundwater system, which drains into the lake. Groundwater provides a source of cooler water and helps lower the temperature of Lake Sammamish. Ultimately though, if lake conditions continue to be inhospitable for Lake Sammamish’s native kokanee, recovery efforts will continue into the future.